Twelve? Why twelve? To me, twelve would probably mean the 12 months in a year? So twelve cups means u go there once a month for a cup of coffee? Lol..
My family and I went to Penang for CNY, my parents hometown are at Sungai Petani, Kedah, so we just stopped by penang for food hunting. After all the char kuay teow and fried oyster, I needed (I REALLY NEEDED) something sweet to complete my meal. So, I suggest Mille Crepe! 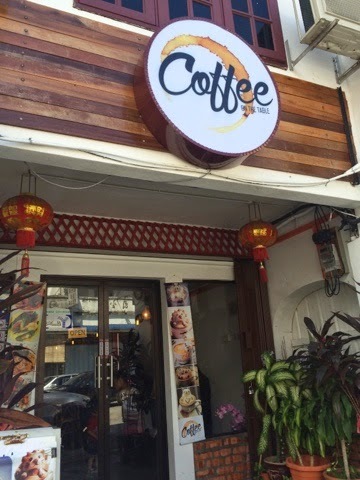 Googled arouud and found this cozy lil cafe along beach street. It was not hard to find with WAZE (I pronounce it was WA-ZY, it's cuter this way :p and im a big fan of WAZE) And here's the place! Go along beach street and look for this shop. Am not from penang, so i just follow Waze. A creative deco on the wall. Feeling good y'all! So, their Tiramisu was not that good. The coffee flavor was not enough, it was almost like vanilla... But the Hokkaido Chocolate was really good. They do have a unique range of flavors, would definitely go back there to try the other flavors. All in all, I would give the Hokkaido Chocolate 8/10 and the tiramisu 6/10. Hokkaido Chocolate Mille Crepe Cake.